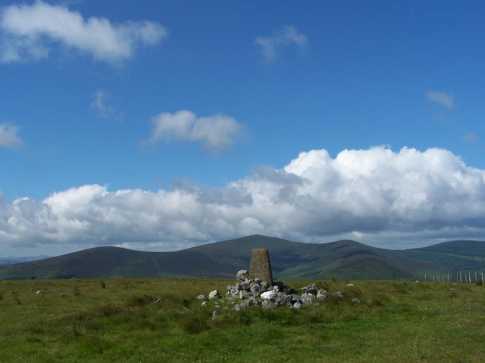 Picture from group : Flatish summit with easy walking options. View from west. 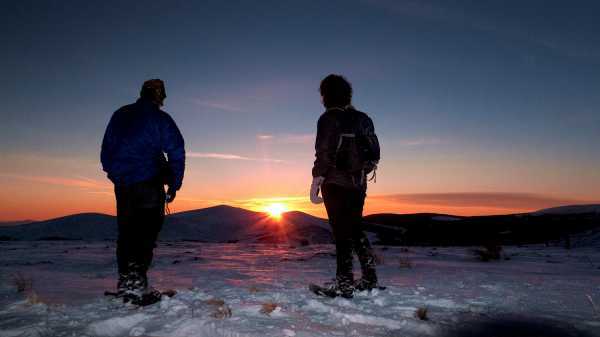 Picture: Flatish summit with easy walking options. View from west. Flattish place of wooded walks and good views. Kirikee from the Shay Elliot memorial on the Military road between Laragh and Glenmalur is an easy climb in normal conditions but in winter is an altogether different prospect. On this Christmas day we decided to avail of the the exceptional snowy conditions before the impending predicted thaw with the incoming Atlantic front. The road up from Laragh along the Military road gradually deteriorated as we approached the parking area near the memorial and snow chains were necessary for the final kilometre or so. At the parking area we were greeted with an unusually tranquil landscape which was covered in a twinkling blanket of snow. The route to Kirikee is over the gate on the east side of the road (which was not too easy as we were wearing snow shoes). Ignoring the track on the left by the gate we continued about 500m-600m along the track from the gate until there is a track/fire break on the left. We followed this uphill through the forestry through deep, powdery snow and past conifers with their branches laden with snow that reminded us so much of snow shoeing in Scandinavia or North America - for a moment you could almost forget you were in Ireland. After about 700m (and a slight deviation to the left) we left the forest and came across a fence line. Following the fence line to the the right leads to the summit of Kirikee. We arrived on the summit just as the sun was setting over Croaghanmoira and Ballinacor. The view of the setting sun was spectacular and we lingered until it had set below the horizon to take some photographs before turning tail to descend back to the car. As the sun set so the temperature dropped and on the drive back via Laragh dipped to -11C. 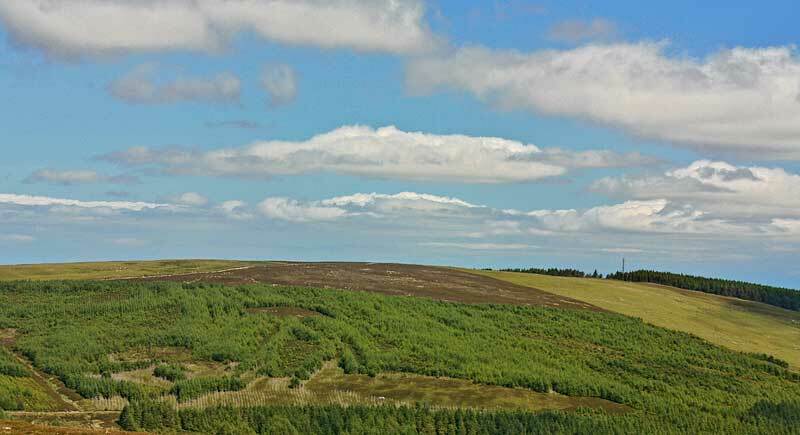 Picture from csd : Trig pillar and view NW, with Scarr visible to the right of pillar. 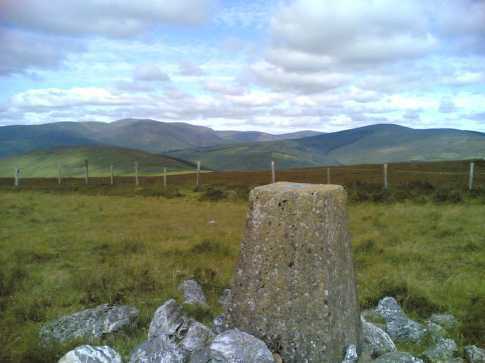 Picture: Trig pillar and view NW, with Scarr visible to the right of pillar.